I’ve been designing a breakout board for the ACS758 hall-effect current sensor. The first few prototype boards came in and I decided to give them a quick test. The results were not quite as I expected so I thought I’d put write about them here, for others that might be using this IC. These current sensors come in a number of ranges (50A,100A, 150A and 200A, all with uni and bi directional variants). They use the hall-effect, which measures the change in the magnetic field to measure current. This means you do not need to install a shunt resistor, with its associated power loss and voltage drop. The board requires a 3-5V supply and outputs a voltage signal which is proportional to the current flowing through the main part of the device. I was using testing a couple of ACS758-LCB-050U, which is the uni-directional 50A version. The first thing to take note of is the output voltage when the current is zero. This is NOT zero. So the output voltage for 0A is 0.12 x Vcc. With Vcc at 5 V the output will be 0.6V and at 3.3V the output voltage will be 0.396V. 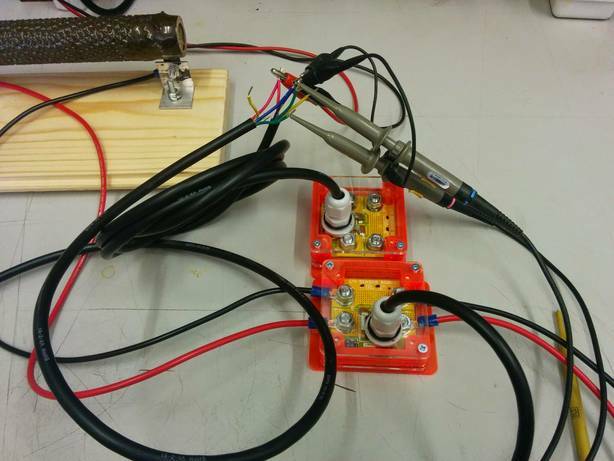 Traces with 5V power supply and 0A. 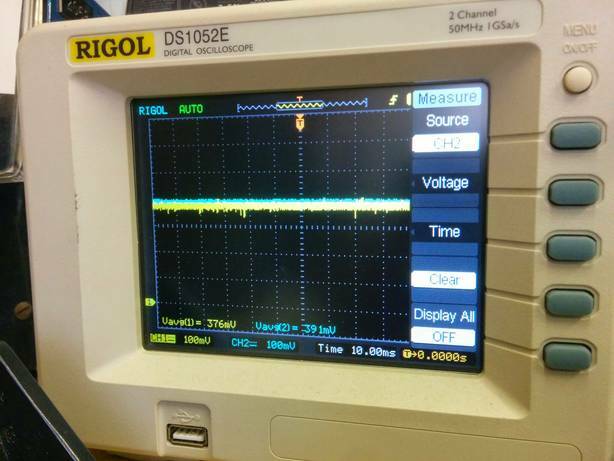 The yellow and blue lines are outputs from two sensors. The average outputs are 0.597V and 0.592V, so quite close to the 0.6V calculated, but still a bit off. This might be due to variation in the input power supply voltage. 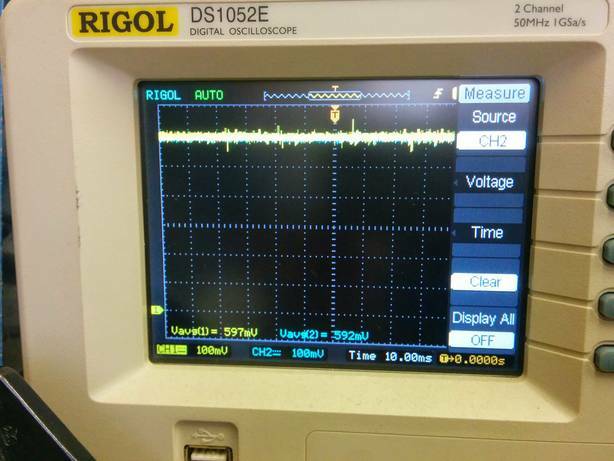 At 3.3V supply a slightly weird thing happens, the output voltages at 0A are different. The calculated output voltage is 0.396V, but I am seeing 0.376 V (yellow) and 0.391V (blue). As the power supply voltage is reduced, we see that the normal 0A offset voltages start to vary from each other. This would be fine if they were the same, as we can just put an offset in to the code, but each one is slightly different. There is a 15mV difference, which is within the data sheet tolerances, but causes bad results if the same conversion algorithm is applied to each sensor. This suggests that each sensor will need to be calibrated separately, which needs thought at the code stage. For this IC it is 60mV per amp. 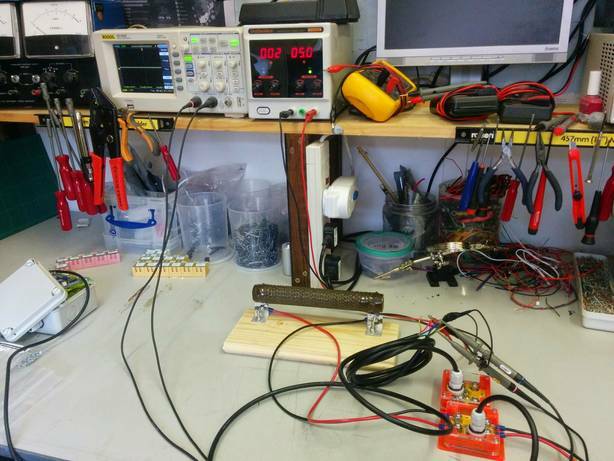 I rigged up some test loads and tried to calculate the current from the output voltage. This was not working until I realised that the sensitivity is ratio-metric to the input voltage. This means that the sensitivity at 5V input is 60mV, but it will be less at 3.3V input. The difference will just be the difference between the power supply voltages: so 3.3/5.0 = 0.66 or 66%. This means the sensitivity at 3.3V is 60mV/A x 0.66 = 39.6mV/A. We are supplying the ACS758 with 3.3V, our zero offset reading was 112 and our ADC reference voltage is 3.3V as well. I took this reading when I had 6A flowing. This means there is still some offset/calibration to do, but its within 2.5%. thanks for info on ACS758 Hall Effect Current Sensor. I recently aquired one from another source and the results with Arduino were not what I expected. The datasheet is a masterpiece of obfuscation. I found a description of what was meant by ratiometric. With a bit of imagination the data in the datasheet and the answer to the question are consistent. I have a bi-directional ACS758. If the supply volts to the ACS758 and reference volts for Arduino A/D are the same the errors cancel out. While the mV/A from the ACS758 change with supply volts the A/division is constant (at least between 4.5 and 5.5v. The other quirk for bi-directional is that the digital output from the A/D converter is 0 – 1023. The centre is 511.5 which never occurs with a single reading. I’ll introduce a dead band around zero, I’ll assume both 511 and 512 are zero. The offset is constant, the min and max analogue read values are 900 (calculated as 900.2) and 123 (122.8). There will be similarly simple Arduino code for uni-directional ACS758. I haven’t tested down to 3.3 volts.